At Saskia’s nail and beauty salon on the Gold Coast looking great and feeling confident is of the up most importance. 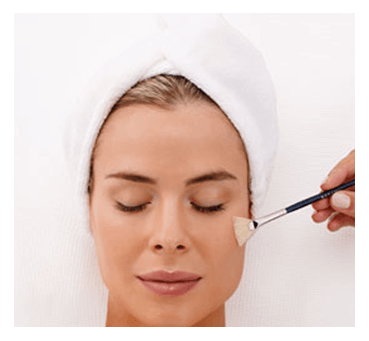 By offering services that range from facials to skin peels to assure that your skin is at its best. ASAP has a range of non-invasive skin peels available that will revitalise and rejuvenate the skin with minimal down time, improving the texture of the skin by removing damaged outer layers to reveal fresh, younger looking skin. How do regular skin peels help your skin? Benefit the face, neck, hands, and décolletage. Lactic peels are recommended for dry, mature, and sensitive skin types in need of hydration. This Lactic Acid skin Peel will soften fine lines and wrinkles, target pigmentation and sun damage, and stimulate collagen and elastin, leaving the skin feeling smooth and hydrated. Visible peeling is unlikely however, individuals respond differently to peel treatments and light peeling may occur. A Glycolic Acid skin Peel softens fine lines, wrinkles, evens out skin tone, hydrates the skin and stimulates the formation of collagen and elastin. Also, recommended for mild photo damage and acne. Recommended for mild pigmentation, hyper pigmentation, mature skin and UV damage. Improves skin texture and restores a fresh smooth, more youthful radiance to the skin. Visible ‘eraser’ peeling may occur 3-5 days’ post peel application. A clinically proven treatment for oily and acne-prone skin achieves great results. Using scientifically formulated products, in combination with the ASAP Reveal Skin Peel this treatment will assist and improve the management of problematic skin. ASAP Gym for the Skin work out provides results-driven treatments tailored to help you reach skincare goals. Using a combination of Peels and Vitamins A, B and C to enhance the outcome of the treatment. Combined with effective home care, ASAP gym for the Skin ensures you are on the right track for healthy, beautiful skin. Treat Acne from below the surface of the skin with this super effective treatment to clarify, sooth and prevent skin impurities. Gentle exfoliation combined with optimum levels of glycolic acid will treat acne and provide a thorough cleansing regime for oily and blemish prone skin. Skin is left clearer, smoother and refresher. The replenish skin workout provides the ultimate hydrating treatment for tired, dull of dry skin. Encourages beautifully hydrated skin, softens fine lines and a smooth, even surface. Call our Gold Coast beauty salon for bookings and enquiries on all or any of our services. Our professional Nail and beauty salon on Gold Coast is the perfect and relaxing venue for all your nail art, facials, and waxing needs.